Exciting and Busy Friday Meeting today! 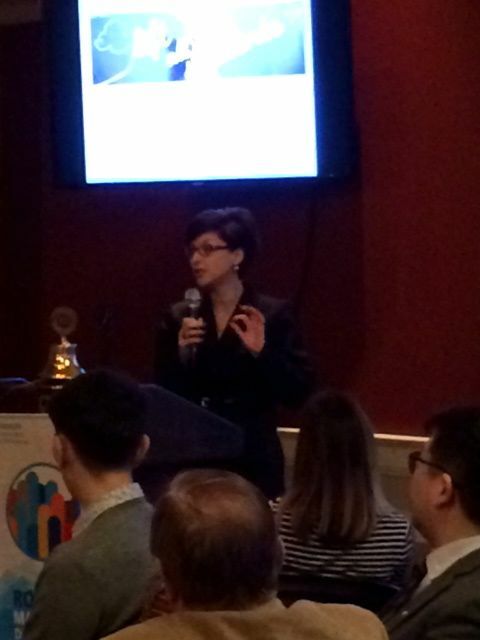 Focus on Education in Mongolia and in our Community in Ohio. With many visitors from Tolles and the focus on the Technical and Career Guidance we are fortunate to have for our Dublin students and 6 other communities served by Tolles, we also had the opportunity to hear from Ari Khurelbaatar, Past President of the Narlag Ulaanbaatar Rotary Club visiting with David Hansen and David Kittredge of the Hosting Dublin Worthington Rotary Club. • Peter Georgiton shared February 3rd is the date of the Progressive dinner, Sarah Richardson is sharing her home and has the details! • Peter Fuhlbrigge shared that the Polar Bear Open is up to 40 golfers on February 10th, more are welcome. A good crowd is expected for sure. • A reminder that our major fundraising event is March 10th this year and Blarney Bash can use more sponsors, Allan will be sharing more on this. We will be getting a volunteer opportunity for sign ups as well from Cindy Groeniger. Volunteers will be appreciated during the event, before for set up and the day after for take down activities. • Jack Curtis is still asking volunteers to contact him for the March 24th fund raising lunch event benefiting Heartland High School. • A new date, April 15th, the Strides for Sobriety 5K event and more details to follow. 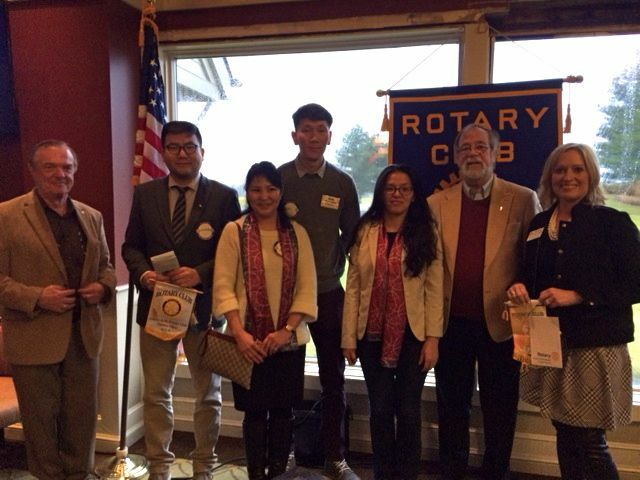 Our visitors from the Rotary Club of Narlag Ulaanbaatar shared their appreciation for kindergarten and primary school books that were shared from the State of Ohio. Past President Ari Khurelbaatar discussed the importance of early childhood schooling and shared many data points such as 60% of Mongolian citizens are below the age of 30! ARIUNGOO Khurelbaatar, female, Mongolia-qualified lawyer. OCHIR Bayarsaikhan, male, Environment/anthropology. Currently working with an energy company. Service Projects Committee chair of Rotary Club of Narlag Ulaanbaatar. Key project personnel. KHAJIDSUREN Namkhai, female Professional background: literature teacher. Project staff of Early Education Program of Mongolia Education Alliance Program. Key personnel in the joint project. Have experience of being a children magazine of the one of the biggest publishers in Mongolia. CHIMEDNYAM Purev-Ochir, male, Director of Operations of the Business Council of Mongolia. President Elect 2017-2018 of Ulaanbaatar Peace Avenue Rotary Club. Our Speaker was Emmy Beeson, Superintendent of Tolles Career & Technical Center and Connie Strebe, Satellite Director joined her at the podium for a quick review of the locations and special programs offered. Page Vornbrock introduced our guest Speaker and shared how we were fortunate enough to have Emmy as Superintendent of the Tolles system. Emmy shared the mission LIFT ALL STUDENTS and Making a Difference. Programs range from traditional Auto Collision Repair or Construction technologies to newer areas such as Video and Media, Computer Networking, Pre-engineering in Manufacturing, Pharmacy and many more. Connie also shared the satellite programs in Dublin and the Middle school programs. Emmy invites the community to visit the Culinary school and she enjoys working to see the employment rates and advanced school next steps of the Tolles graduates. Several examples of the student successes were shared and very impressive. Christy Vente was also able to join us and she will be sharing the Emerald Campus as one of our speakers January 26th with Dr. Todd Hoadley. It is energizing to hear of the educational opportunities available and the range of programs now available in our State.